Engineers from Dartmouth’s Thayer School of Engineering have created a radical new imaging technology called “Quanta Image Sensor” (QIS) that may revolutionize a wide variety of imaging applications that require high quality at low light. 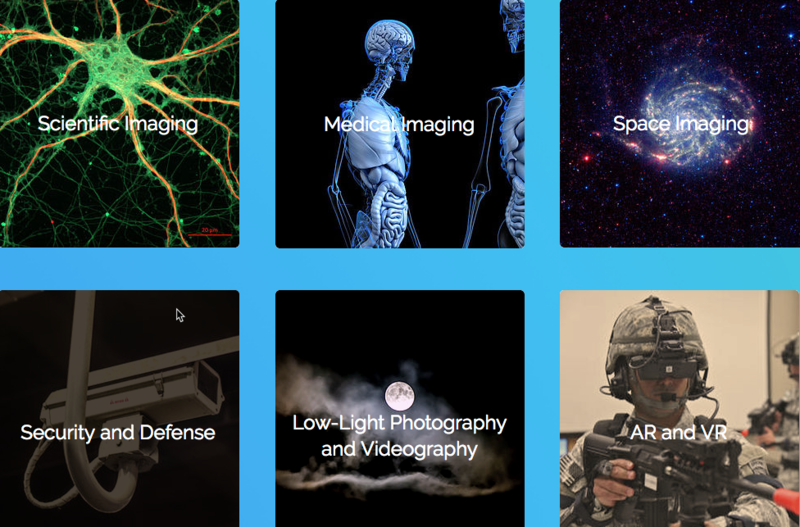 These include security, photography, cinematography, and medical and life sciences research. Low-light photography (at night with only moonlight, for example) currently requires photographers to use time exposure (keeping the shutter open for seconds or minutes), making it impossible to photograph moving images. The new QIS technology can capture or count at the lowest possible level of light (single photons) with a resolution as high as one megapixel* (one million pixels) — scalable for higher resolution up to hundreds of megapixels per chip** — and as fast as thousands of frames*** per second (required for “bullet time” cinematography in “The Matrix”). The QIS works at room temperature, using existing mainstream CMOS image sensor technology. Current lab-research technology may require cooling to very low temperatures, such as 4 kelvin, and is limited to low pixel count. For astrophysicists, the QIS will allow for detecting and capturing signals from distant objects in space at higher quality. For life-science researchers, it will provide improved visualization of cells under a microscope, which is critical for determining the effectiveness of therapies. The QIS technology is commercially accessible, inexpensive, and compatible with mass-production manufacturing, according to inventor Eric R. Fossum, professor of engineering at Dartmouth. Fossum is senior author of an open-access paper on QIS in the Dec. 20 issue of The Optical Society’s (OSA) Optica. He invented the CMOS image sensor found in nearly all smartphones and cameras in the world today. The research was performed in cooperation with Rambus, Inc. and the Taiwan Semiconductor Manufacturing Corporation and was funded by Rambus and the Defense Advanced Research Projects Agency (DARPA). The low-light capability promises to allow for improved security uses. Fossum and associates have co-founded the startup company Gigajot Technology to further develop and apply the technology to promising applications. * By comparison, the iPhone 8 can capture 12 megapixels (but is not usable in low light). ** The technology is based on what the researchers call “jots,” which function like miniature pixels. Each jot can collect one photon, enabling the extreme low-light capability and high resolution. *** By comparison, the iPhone 8 can record 24 to 60 frames per second. In several emerging fields of study such as encryption in optical communications, determination of the number of photons in an optical pulse is of great importance. Typically, such photon-number-resolving sensors require operation at very low temperature (e.g., 4 K for superconducting-based detectors) and are limited to low pixel count (e.g., hundreds). In this paper, a CMOS-based photon-counting image sensor is presented with photon-number-resolving capability that operates at room temperature with resolution of 1 megapixel. Termed a quanta image sensor, the device is implemented in a commercial stacked (3D) backside-illuminated CMOS image sensor process. Without the use of avalanche multiplication, the 1.1 μm pixel-pitch device achieves 0.21e− rms0.21e− rms average read noise with average dark count rate per pixel less than 0.2e−/s0.2e−/s, and 1040 fps readout rate. This novel platform technology fits the needs of high-speed, high-resolution, and accurate photon-counting imaging for scientific, space, security, and low-light imaging as well as a broader range of other applications.